Experience the arctic circle and amazing northern lights with our Alaska Aurora Tour and Arctic Circle Tours. Your Arctic Circle / Aurora Borealis day begins right at your Fairbanks hotel, so you don’t need to plan how to get to us and you will save additional taxi costs. Free guest pickup from 12:15pm to 1pm. 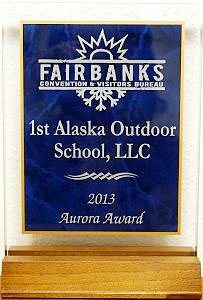 A day full of information and knowledge about Alaska. We’ll take you from Fairbanks to the Arctic Circle on the famous James Dalton Highway, featured in the TV series “Ice Road Truckers”. Please be aware that we cover a total of 400 miles in this 14-hour van expedition. Have your picture taken on the Arctic Circle and receive a “Cross the Circle-Certificate”. En-route, enjoy stunning views of interior Alaska, the Trans-Alaska-Pipeline and the mighty Yukon River. You may see moose, lynx, and fox in their natural habitat. * Pipeline photos and snowy mountain photo courtesy of Sherman Hogue/Explore Fairbanks. Trans-Alaska-Pipeline – Get a close up view of the famous pipeline and learn interesting facts about the engineering and building period. Arctic Circle – Have your picture taken at Arctic Circle and receive your Arctic Circle Certificate. Yukon River – Walk right to the edge of Alaska’s most famous river. On the return journey to Fairbanks we pass many high elevations, perfect for possible northern lights viewing. We provide ham (or veggie) sandwich, chips, sweets, two bottles of water and hot drinks. Please feel free to bring extra food.